Every now and then you get some priceless encouragement just when you’ve been wondering if you are out of your mind. I had that happen to me a few weeks back when I got an email from Todd Woodson, drummer and board member of the Central Virginia Jazz Orchestra. (CVJO) Todd had read a blog post I did a while back on Marc Myers blog JazzWax. The article brought a lot of kudos for my work on the film and creating a happy ending for its subject, Frank Foster. I received several congratulatory notes that meant a lot to me and certainly made me feel great. I even got a check for $50 from a reader in Michigan. I never wanted to be one of those “Independent Filmmakers” pleading for finishing money, Perhaps I was a bit naive and optimistic when I embarked on this adventure. Then again, I may not have started or gotten as far as I have had I not been both naive and optimistic. However, the truth be told, I’ve invested an awful lot of my own money into making this film to date. I knew it was a gamble and I recall telling a pessimistic (realistic?) friend that I knew my faith would be tested. I had been given an A-list of people that would presumably kick in some dough and use their entertainment connections to promote the film if I put together a great demo. That was all I needed. I dove headlong into the project as the economy collapsed and funds that may have been available somehow dried up as even the wealthy tightened their belt buckles. The wind to fill my sails has yet to materialize. I didn’t give up. I still haven’t. 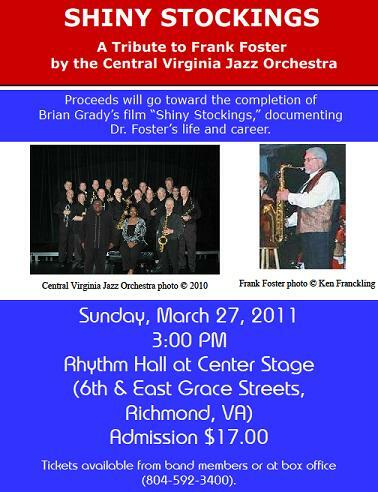 And now, thanks to the generosity of the Jazz Orchestra in Richmond, and their dedication to their art and their appreciation of what Frank Foster has done for that art and, of all things, my efforts to bring his story to light, I have a new boost both spiritually and financially. 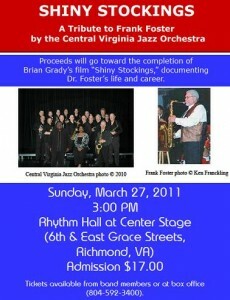 On March 27th The CVJO will perform a benefit concert and tribute to Dr. Frank Foster. Thanks one and all, especially Frank and Cecilia Foster. I was told that the orchestra originally wanted to split the proceeds between the film expenses and the Fosters. They said, “No, give it all to Brian, he deserves the support”. I had mixed feelings about that. I spoke to Cecilia on the phone and told her I didn’t think that was right, that it’s Frank’s work that created the opportunity and I feel a bit odd having a benefit done for my film. She said “Brian, you’ve done so much for us and put so much work into this thing. Your making a movie about Frank has done so much for his spirit, and now it has to get finished and shown and it will do more good that way than any money from this concert could.